In preparation of a case management conference that Judge Alsup will hold tomorrow (Wednesday), Oracle and Google submitted a joint case management statement late on Monday that identifies the remaining issues that need to be addressed. There is still some potential disagreement over cost reimbursements that Google is seeking from Oracle, and they are still negotiating the amount of statutory damages in order to save the effort of a damages hearing, but, most importantly, both parties "request that the Court enter final judgment in this matter" and propose two alternative forms of a final judgment. Cost reimbursements and statutory damages are small amounts for these two companies, compared to which it's actually more interesting to see how they would like Judge Alsup to summarize the outcome as it stands now (prior to the appeal). Both proposals for a final judgment are different in substance, structure and style (Oracle's goes into more detail than Google's). Also, they are sorted by procedural rather than substantive criteria. For the purposes of my own analysis I have regrouped the different items and will now explain the differences between the parties' proposals. 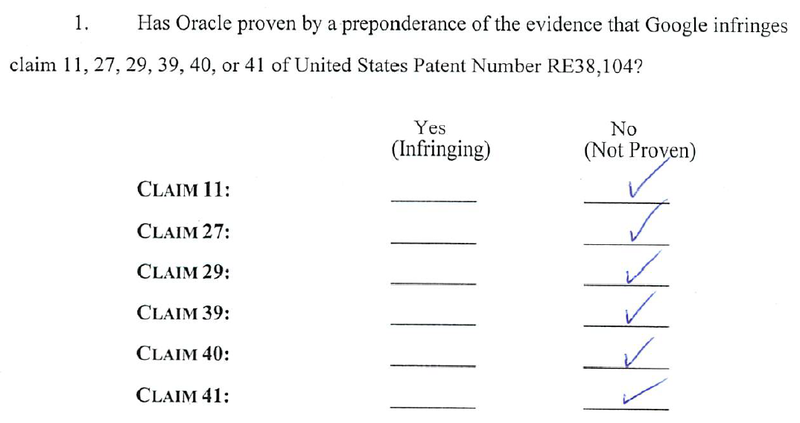 There are two categories of patents-in-suit: the two that were actually asserted at trial and the five that were previously withdrawn by Oracle as part of a deal with the judge to get a spring trial. The judge also convinced Google to withdraw its invalidity defenses with respect to the two patents that went to trial. In reexamination, the USPTO did not agree with Google. The '520 patent was upheld in a final Office action, and the first Office action that declared the RE'104 patent invalid based its reasoning on other (combinations of) prior art references than Google did. Oracle's proposal stresses the voluntary nature of its own withdrawal of five patents and, for the sake of consistent standards, of Google's withdrawal of its invalidity contentions. Oracle nevertheless states that the patent infringement claims it withdrew were dismissed with prejudice, but it recalls that the court requested such withdrawal only with an exception for "new products", which a footnote clarifies to mean products that Google may introduce after the date of the judgment. Google makes no mention of this. As you can see, the jury was instructed that Oracle had to prove infringement by a preponderance of the evidence. Accordingly, the two possible answers were: "Yes (Infringing)" and "No (Not Proven)". The explanation for "No" was "Not Proven" -- as opposed to "Not Infringing". With respect to Google's requests for declaratory judgment of invalidity, the parties agree that those were moot with respect to the five withdrawn patents, but disagree on what happened to those requests with respect to the two trial patents. Oracle says that the related counterclaims are "voluntarily dismissed with prejudice", while Google wants all counterclaims for declaratory judgment of invalidity to be considered "dismissed as moot". There's a potential difference here with a view to future litigation involving the same patents but new Google products. I know I've said this more than once before, such as in connection with the '720 patent, but it's important to keep in mind here that Oracle would still have the option to assert its patents -- the withdrawn ones as well as the ones that were put before the jury -- against Android device makers. I don't know whether Oracle will want to do that. Many of those may actually be Oracle customers. But it would be mistaken to assume that Oracle can no longer assert those U.S. patents against Android under any circumstances. 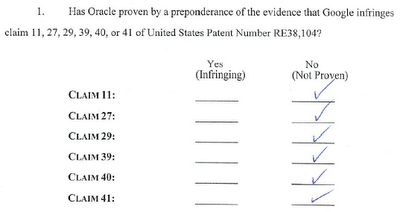 Also, Oracle could use international equivalents of any of those patents in other jurisdictions. Oracle's proposal states the different elements of the partial jury verdict and the judge's rulings as a matter of law with respect to copyright liability, while Google just proposes to enter judgment for one party or the other for each item based on who prevailed on the bottom line. Since Google just needed one defense to succeed with respect to a given item, it isn't interested in stating the parts that worked out in Oracle's favor or the part that was simply not decided by the jury in any way ("fair use"). Oracle, however, has a clear roadmap for its appeal. The basis of Oracle's appeal will have to be that Judge Alsup's ruling on (non-)copyrightability of the structure, sequence and organization of the 37 asserted APIs should be overturned by the appeals court. Oracle wants to preserve the jury's related infringement finding. While the details of the partial jury verdict are important, the parties are going to reference the entire procedural history of the case in their appellate pleadings anyway, whether or not there is a recital stating the partial verdict. But the final judgment will be the starting point for the appeal. The parties don't disagree on the implications of the different decisions for Google's counterclaim for declaratory judgment of non-infringement as far as Oracle's asserted copyrights in the 37 Java API packages are concerned. Oracle considers this one "dismissed as moot in light of the Court’s dismissal with prejudice of Oracle’s infringement claim", and Google also considers it "dismissed as moot", without further explanation. Considering that Google put its equitable defenses, including Jonathan Schwartz's testimony, front and center at the trial, it's noteworthy that it doesn't mention the court's decisions on its equitable defenses at all. Not one word. Judge Alsup entered his findings of fact and conclusions of law concerning Google's equitable defenses on May 31, the day on which he also ruled on copyrightability. While his copyrightability ruling got all of the attention, his equitable defenses ruling went unnoticed by most people. In his May 31 order on equitable defenses, Judge Alsup concluded that "Google's defenses of implied license and waiver are rejected on the merits and Google's defenses of equitable estoppel and laches are denied as moot". Oracle wants this fact to be stated in the final judgment, and accordingly wants Google's implied license and waiver defenses to be considered "dismissed with prejudice". Even Oracle's proposal doesn't mention that the jury's advisory verdict on equitable defenses was that Sun had acted in ways that could have led Google to believe it didn't need a license, but at the same time the jury did not find that Google actually relied on having a license. Should the question of equitable estoppel become relevant again on remand (a possibility that Judge Alsup's order also mentions), Google faces a significant problem because the factual record is now that it did not actually rely upon what Jonathan Schwartz said. For an equitable estoppel defense to succeed, reliance is an indispensable requirement. "Google's equitable defenses rest primarily on a November 2007 blog post by Sun's CEO congratulating Google on the release of Android, as well as similar positive statements by Sun executives thereafter. Congratulatory statements do not fall under the narrow circumstances proscribed by our court of appeals. Even if Google understood Oracle and/or Sun's conduct to condone use of the Java API packages, the 'course of conduct' must be assessed for an affirmative grant of such consent. None is apparent from the evidence Google presented here. Google has supplied no relevant authority that would support a finding in its favor on these facts. Furthermore, from the present record it would be impossible to determine the scope of any implied license. Under Google's theory, infringement is excused as to any aspect of Android because the whole of the platform was generally applauded by Sun. Such a finding is not supported by precedent. The parties negotiated for a real license but the talks collapsed and no license was given. It would be most bizarre to somehow find an implied license in this scenario. This is consistent with what I've been saying for a long time. I have since last year been saying that the Schwartz blog post wasn't nearly as important as some other people commenting on this dispute thought. I restated this in my first post on the trial. The order from which I just quoted was entered after the trial, but there was plenty of evidence and testimony in the record beforehand. Schwartz got deposed long before the trial, for example. In retrospect I find it hard to reconcile the judge's wholesale dismissal of the Schwartz defense (a dismissal I agree with) with his denial of Oracle's request to decide on this issue ahead of trial and to avoid the confusion of the jury that definitely resulted from Schwartz's testimony. What Judge Alsup wrote in that May 31 order is such a clear dismissal of Google's theories that he really didn't need the trial to find out that Google had no evidence for an implied license or waiver with respect to any particular intellectual property rights at issue in this litigation. The fact that Judge Alsup allowed Google to make lots of noise about something that was legally fatally flawed from the get-go was prejudicial to Oracle in two respects. It misled the jury, which was presumably influenced by the whole Schwartz story in connection with "fair use" (even though it was a separate legal issue at a strictly rational level), and it also influenced the perception of some of the journalists who attended the trial. I followed some journalists' coverage on Twitter and some of them were absolutely amazed by what Schwartz said, how he said it, and how the jury reacted. Whether there's anything to admire about a guy who was lining his pockets while running a company into the ground is another question. At any rate, the whole Schwartz show could have been avoided if the judge had thrown out at least the implied license and waiver defenses ahead of trial, which he could have done since Google had failed to plead any facts that could ever have satisfied the legal requirements for those particular defenses. The judge wanted to throw out as many patent claim as possible in order to reduce the amount of time the jury would have to spend in court. Case management is a good thing, and Judge Alsup excels at it -- but he didn't apply the same standard of pre-trial narrowing to Google's implausible equitable defenses. Should Oracle prevail on appeal with respect to copyrightability, and should the "fair use" question have to be retried by a new jury as opposed to being adjudicated as a matter of law, Google is going to have a much harder time because it won't be able to confuse the jury with an "implied license" claim that Google's lawyers themselves certainly knew didn't have any realistic chance of succeeding -- it was just a smokescreen to make the jury less likely to find in Oracle's favor on liability and "fair use".